Paradise parking lot at about 9:45 and headed up. We were thinking of perhaps dropping over an up to check out the base of the Fuhrer Finger, but I was a bit concerned with all the wind and transport, so headed up to the opening of Nisqually chute. I was even concerned about that as it was right on the leeward side. Concern subsided as we got to the opening and it appeared there hadn't been much deposition on the right side, while the center of the chute appeared smooth. Today was not the day for taking things on appearances though. Right side of the chute was I guess what I would call "pre-sastrugi" - wind affected but not really set up hard in a sastrugi kind of way. Within every turn there were around three different snow transitions from soft shallow wind slabby to a thin breakable crust to hard windpack. Things were pretty stable. 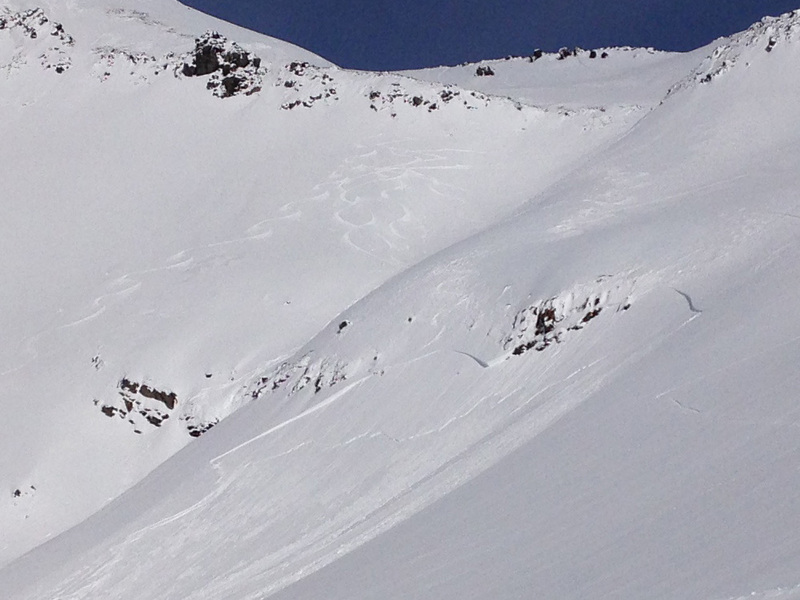 From about 1/4 of the way down at the first stop, I observed one solo skier at the bottom of the chute. Looking at the middle of the chute, it *appeared* to have some wind deposition, but upon physical inspection, the snow wasn't even being deposited, the wind was blowing down the chute and not really depositing anything, it was pretty much carvable, semi-variable wind pack. It was skiing a bit better than the skier's right side, so we took it down the center to near the bottom, then started cutting right above the shallow gulley at the bottom, and another set of turns. Then grabbed a little bite. We observed the remains of a natural point-release one chute down from the main one. It was discussed quite a bit how it occurred. It was a very similar aspect to Nisqually main, but a little lower. It had seen traffic in the past week at least (I was up in the same area this past Monday). As we were waiting, another 3 riders came in above us and took some great lines across the rock band at the bottom and stopped where we were. We had finished up, and were looking at taking the early exit out of the valley, then decided to head up to the top of the pitch they had just skied. So at this point my concern was on what visually appeared to be some side-loading, but again, upon inspection was some featured wind pack that required us to put on ski crampons, and was solid. So I say "concerned" a lot because, after skiing b/c in Colorado for ten years, that's my modus operandi. Nearly everything is assessed, internally first to see if it's a reasonable hazard, then amongst the group. My partner and I did the same today. So, now we get to the juicy part. My partner and I discussed the lines we were going to take; he took the skier's right line around the rock band. I watched him head� down, over the roll, then saw him exit and stop at a good spot. Another party of 3-4 had also just descended, so there were about 8 altogether. I chose a line left that was a wide opening in the rock line. First carvy windpack, then icy for about 20 yards before the transition through the rock band to what promised to be something softer. I think I took a couple good turns, the snow transitioned a bit, I caught an edge, recovered and started making some more turns when I realized the snow was moving and that I must have been in a slide. There wasn't much thought at this point, but knowing what the terrain was and the speed of the snow I decided to run it out. I was a little concerned as the touring skis I was on don't have a high top-end, but it worked out alright. I think I took the fall line, then headed left and out. Anyway, I got away with it. The immediate next concern I had was for my partner, so I checked and he was out of the slide's path. It's funny, I think I have more adrenaline going now than when it happened, things were pretty clear from an experiential perspective. This was a hard slab slide, with a pretty wide crown, probably 100-150' and a crown of about 1'-3'. Looking at the debris, it would have been a knee- to waist-deep burial. Pics will be below. So, the main reason I think I'm writing this post is to help me process it and get some lessons for the future, a bit of a journal exercise. I also want to give a heads-up to people heading up there so they know what's going on and the potential. The good: my partner and I discussed a lot on the way and came to consensus at every point. We proceeded one-at-a-time and observed each other. We also had appropriate avy rescue gear at ready and have practiced. I don't really know about calling the rest "bad" though. This was all very subjective. 8-9 other people had skied very similar lines. I think it would have been quite reasonable to not go in there in the first place with the observed potential for wind loading, but again upon inspection, this didn't really hold up. After looking at the slide area, it was understandable how it could have been loaded that way to produce a skier-induced slide, but not any indicators that it was any different from any other similar aspects. It was just slightly more depressed and had just the right relation to the wind. I think for me this is one of the days you remind yourself that it really can bite you at any time, even being careful, but still taking risks. Any one particular analyzed snow sample is not indicative of any other snow. You can really only sample an very, very small part of the hazards around you. Anyway, keep an eye out up there. Again, I had considered not even posting this, or posting anonymously. Part of my goal in expressing my experience is to help others with respect for the mountain and that all accidents are opportunities for learning. Traversing across to the chute. Just a tad breezy, Weezy. Skiing bottom of Nisqually main. Behind the skier is the debris of the natural point-release slide. Looking up at Nisqually chute and natural point-release slide debris. Skier-induced slide. Click for larger. Note skin track on observer's right of slide. Partner's ski tracks go oberver's left of slide and rock band. Pervious party's tracks go observer's left of slide and down gut of rock band. 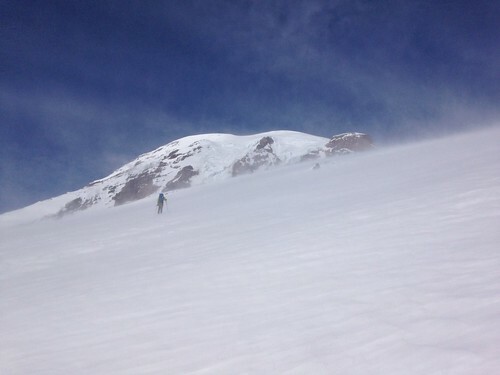 I think based on reflection, that chute with the natural point-release did not have wind running straight down it in the same way Nisqually main did, and thus had more wind-deposited snow and instability. If that had been realized in the moment, a more thorough understanding of the potential hazards of the other slopes could have been realized as well. I'm curious because I was one of the many up there who skied the chute. I made a little ski cut on the skier's right/looker's left of the chute near the rocks at the top and even though it was pretty steep I couldn't get anything to move.� However, on the way out I exited skier's left side of the chute, in an area that's hidden a bit in the exit channel in your first upslope shot. While arcing up to a little steep slope I did get a tiny bit of slab action. This very small section was more W to NW facing than anything else, and I think it may have gotten cross-loaded a bit. The wind was actually coming out of the NE on Saturday, many times heading while I headed up the Muir it was attacking me at the diagonal. I think this ENE or NE wind then swooped straight down the chute and cross loaded that NW slope a bit. It's hard to tell but I think your slope is a bit more NW facing than the rest too, and may have gotten a little cross-deposition. With high winds like Saturday things become a lot aspect specific, and slope specific too. I think the NWAC call of Moderate was a good one, saying that "it's possible but not likely." On a day of reasonable to decent stability, you got unlucky in a lucky (rode it out) kind of way. Congrats on the successful high speed exit. Thanks a bunch for sharing, and for showing me that I was probably a bit to cavalier myself yesterday. I'll be better at mentally separating the various slope aspects on windy days because of this. John, I remember heading up after our lunch for that second run at about 1pm. So we were probably at the top of Nisqually chute around 12-12:30. I think we started up the skin track out you describe, then cut up for that run. I've always kinda frowned when in the ski flicks they show some skier/rider outrunning a slide, that it gives the wrong impression that it's a feasible way to avoid getting buried and that its ok to just ski a nice line. There's sooooo many times that it's not feasible, but today was one where it happened to work out. I would have thought much more about that line and probably not have skied that if there were trees below or some other dangerous feature. What jumps out to me is that you skied a highly convex slope while the others skied through the centre which doesn't have a convexity (or not as large of one?). Also you describe observing hard wind board which can be more stubborn to trigger then a soft windslab depending on age, one observation that might have helped you would have been to check the thickness of the hard windslab. Without being there I have a hard time in identifying what might have helped you but with your observation that others skied nearby without incident I would say you just got knicked for being overconfident in your terrain choice. This year I have experienced two similar incidents as yourself. 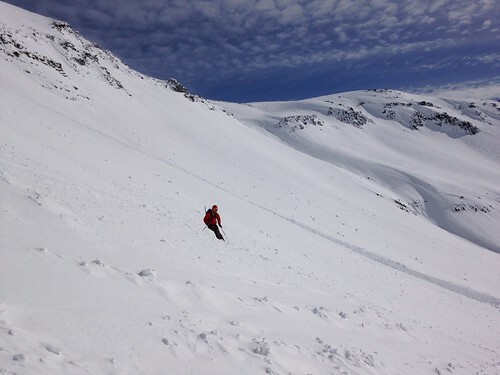 Skiing in relatively stable conditions in steep terrain where others have skied without incident, but in the search for fresh tracks I pushed out into convex �or/and unsupported terrain causing small (but potentially harmful) windslabs to release. "As we all know, the true driving force behind every early morning wake up is not necessarily safety, but the overpowering drive to be sitting on a patio by 1 pm, intoxicated, and spraying loudly about the morning's adventure." Thanks for sharing and including the pics! I think the rock band probably had a lot to do with the release, I have seen a lot of slides trigger below a rock band over the years..it is an unstable set up as the rocks heat up more than the snow and degrade the bonding. What jumps out to me is that you skied a highly convex slope while the others skied through the centre which doesn't have a convexity (or not as large of one?). Also you describe observing hard wind board which can be more stubborn to trigger then a soft windslab depending on age, one observation that might have helped you would have been to check the thickness of the hard windslab. Without being there I have a hard time in identifying what might have helped you but with your observation that others skied nearby without incident I would say you just got knicked for being overconfident in your terrain choice. Yeah it seems like the little headwall was a problem. I can't comment on the lines that were skied at looker's left (in the gully), because I can't see them in the picture. It looks like the headwall itself didn't have too much deposition, probably because it was so steep and because it was a bit more wind scoured (being more convex). But once you passed between the rocks, you ended up on a slope that was almost as steep, but more susceptible to deposition. And that's where the slab was waiting. I wasn't there, so I can't comment on the snow elsewhere in the picture. But of the terrain that I can clearly see, that little headwall looks like the riskiest line. Glad to hear you came away un-scathed, dub_xion. And good on ya for sharing your experience! 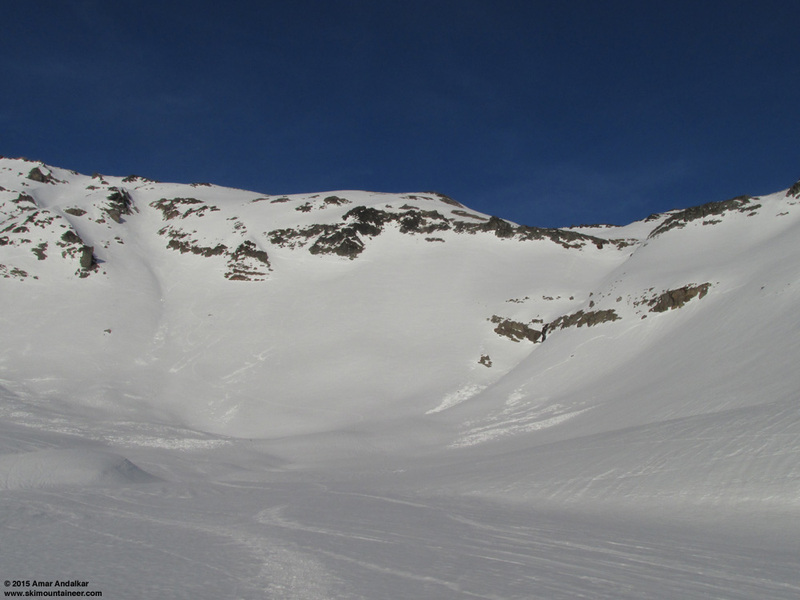 I work with NWAC as one of the professional field observers for the Cascades Central-West zone and wanted to take this opportunity to remind folks that they can share their snowpack and avalanche observations with NWAC directly via our website. Here is the link: http://www.nwac.us/observations/submit/. Historically, the forecasters are quite accustomed to referencing sites like Turns-All-Year. However, posting observations directly to NWAC is very much appreciated and it would be great if there was a slow cultural shift towards using this resource more often. No need to cross post in this case - I'll make sure they read your post. I was in the Crystal B.C. on Saturday, so I can't comment specifically on conditions that day. That said, we've had a number of similar days in the Paradise zone this season....clear, warming temps, recent new snow, mod-strong NE winds, moderate danger rating, a weekend with high skier traffic. There have been a few skier-triggered wind slabs similar to yours and most of them have been in cross loaded/top loaded terrain (often lower than one would expect). The high "western bypass" route around Pan Face is a classic example. Thanks again for sharing, dub_xion. Have a great rest of your winter! Thanks for posting, dub_xion ! It's appreciated, and it can be hard to do. Thanks for the report, glad you escaped the slide safely. Thus it's possible (likely?) 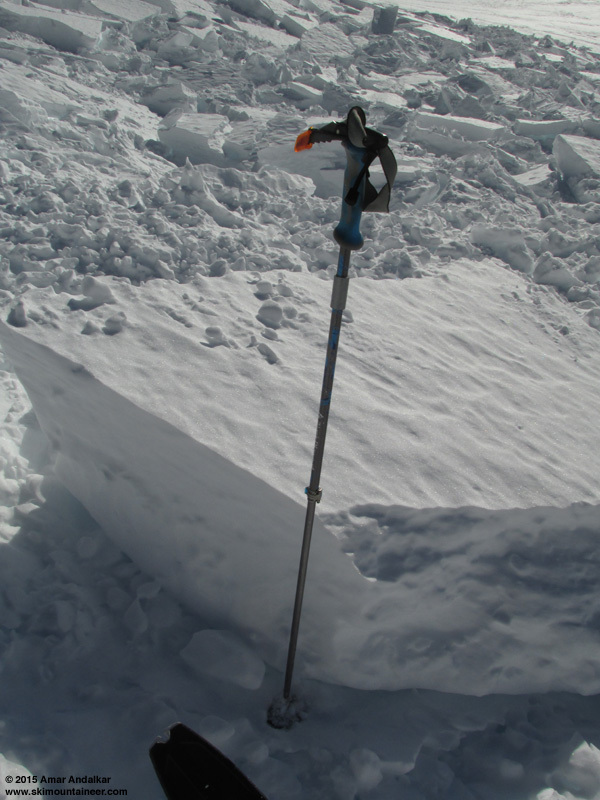 that your avalanche included a newer wind-slab formed during the last 2 days of strong easterly pass-flow winds, sitting atop a slightly older storm-snow slab from the storm system a few days ago (see telemetry and discussion below). By the way, for reference, the slope aspect is almost exactly due west, and the slope angle is about 35-38� near the 2 crowns, perhaps 40� through the rocks, and obviously varying a bit with much deeper snowpacks. The prominent gully in the center of that photo just left (north) of the avalanche is Pebble Creek Gully, through which flows the same Pebble Creek found at the foot of the Muir Snowfield, after it takes a zigzag northward under a smaller permanent snowfield near 7000 ft (its course appears to be mismarked on the USGS topo). There's a good-sized waterfall where the creek flows over that cliff band, often a very hazardous spot in thin snowpack conditions, or during late spring meltout. Best to avoid the immediate area of the gully-cliff intersection with its complex terrain, and instead stick to the smooth open WSW-facing slopes to looker's left, or similar smooth open WNW-facing slopes to looker's right (although that slope can get heavily cross-loaded by normal SW storm winds). 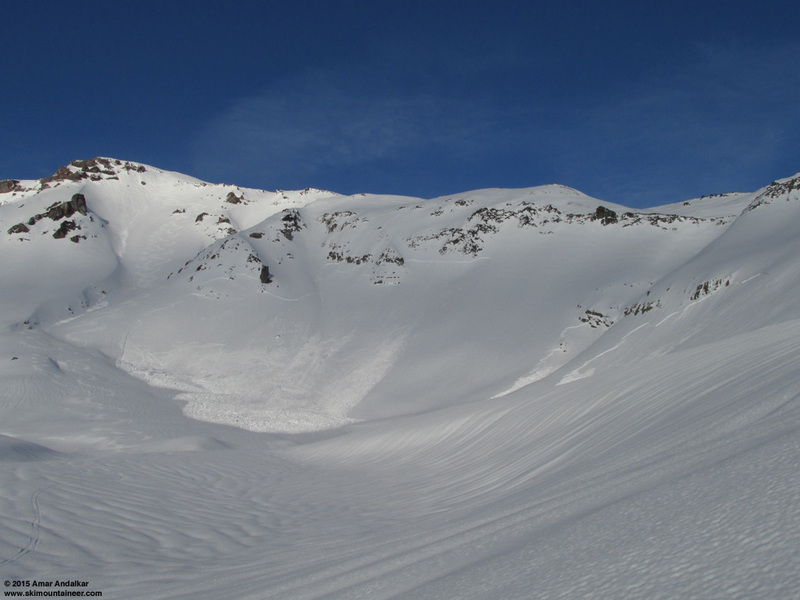 Less complex terrain often means easier detection and avoidance of localized avalanche issues like this one, and such problems may be absent entirely on smoother terrain too. 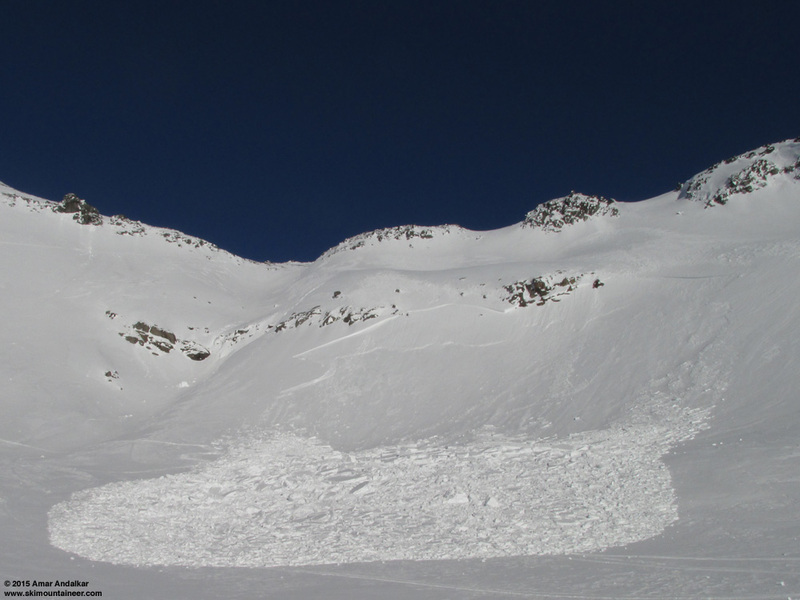 So it's a frequent spot for avalanche trouble! 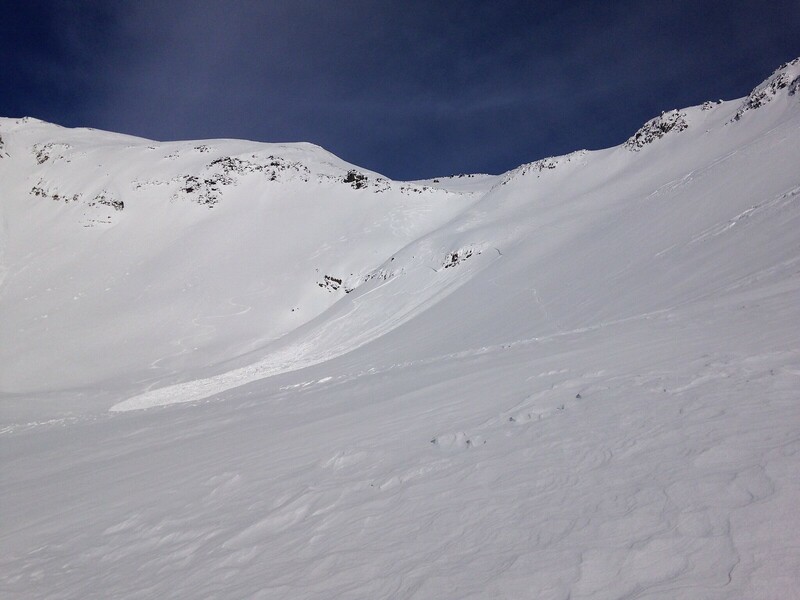 These avalanches, all presumably natural due to the absence of tracks, occurred sometime between January 1 (the previous time I had skied Nisqually Chute) and January 8. It was very stormy on January 4-5, with another major atmospheric river event bringing almost 5" of precip at Paradise with a snow level mostly between 5000 and 7000 ft, coolest on the first day of the storm. Storm winds were almost entirely westerly both days. Looking at that old telemetry, it's hard to figure out when these slabs may have formed and released prior to January 8. Thanks everyone for the contributions. I think the main thing was that all my red flags were up for the area with the wind and visual clues, but they kept getting pulled back down upon inspection or seeing others ski similar aspects. I don't think it was necessarily a herd mentality, but seeing others ski things did affect what data I was processing. Pits...I don't really know, because it would have been really difficult to find any single spot to dig that gave a good indication for anything other than that particular pit (again, based on the variability experienced skiing the area). Thanks for the info on previous activity in the area, Amar. This was the second time I'd skied the area, the previous being the Monday before. For me the big takeaways are to trust my own red flags more, and to continue to adhere to best practices when skiing any slope that is even remotely suspect. Thanks again everyone, I sincerely appreciate being able to share my experience! BTW, FWIW, IIRC that waterfall from Pebble Creek was where a missing snowboarder/med student's body was found much, much later than when he disappeared after leaving Camp Muir in a storm. Glad it worked out and thanks for sharing. I'm with Skier of the Hood and Lowell - that convexity and little bit of steepness and extra deposit got you. I'm not saying I wouldn't have skied it as well, but when there are many options in front of you......I would like to think that I would always try to pick the best one. Great observations Amar. Glad you posted. This is such a skied line. Just wanna echo a thanks for posting. I like Bruce Tremper's new message that we shouldn't shame people who trigger slides so that we encourage more discussion. This could happen to all of us. The convexity and the rocks! Amazing what a little wind slab can do given the right ingredients. Thnx all for sharing your experience and expertise. Its appreciated more than you know. 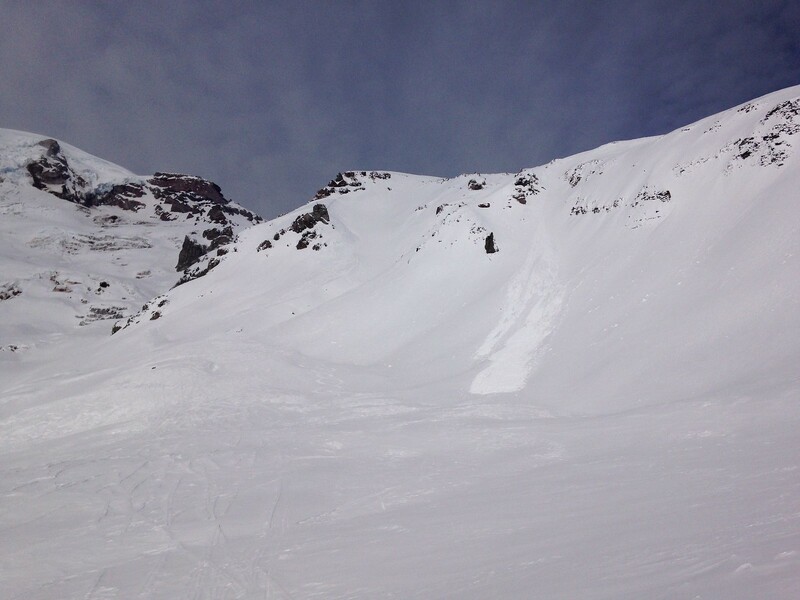 A few more photos of the avalanche debris, taken on Monday February 23 after a group of us skied from Camp Muir via Nisqually Chute mid-afternoon in stable conditions and reasonably good snow (although not nearly as good as the smooth corn or powder which I enjoyed on my 6 descents of the Chute during January 2015). Winds were MUCH lighter than the previous day, since both the strong easterly pass flow and northeasterly upper-level winds had diminished greatly overnight as forecast. Also of note are the numerous fossilized raised ski tracks in the background, these were seen in many locations on Monday mainly from 6000-7500 ft especially near Glacier Vista and atop Pan Point, often raised as much as 1 ft above the older hard crust layer (which incidentally was nicely corning up on most southerly aspects). 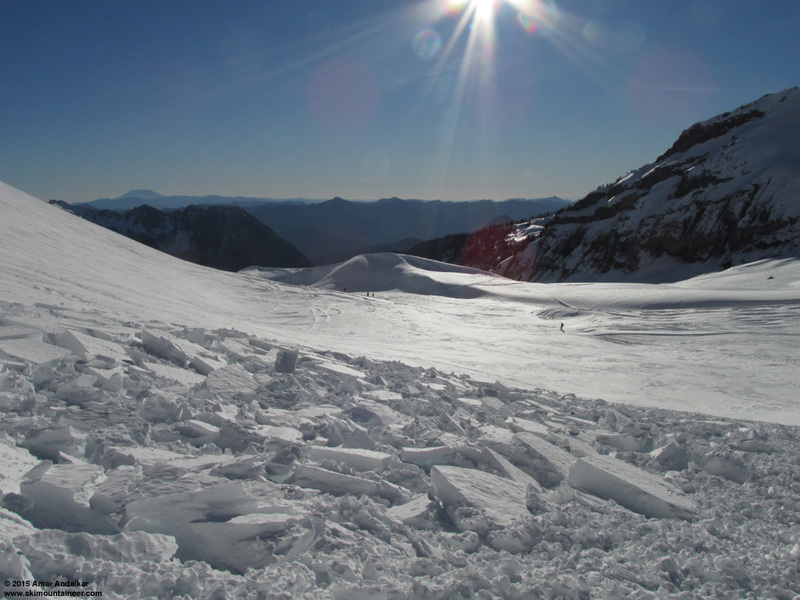 Raised tracks are caused by the pressure of the skis (or snowshoes or boots) compacting and bonding the snow, followed by strong winds which strip away the surrounding uncompacted snow, leaving the firmer snow as raised platforms. This block was about 6 ft by 3 ft, so it has a volume of about 30 cubic ft (almost 1 cubic meter) and assuming a density of roughly 0.3 (reasonable for a firm windslab), it thus weighs about 600 lbs (300 kg)! Wouldn't want to get hit by that! Great post and discussion, will link to my FB page and my series Come Back for Another Day. That hard slab would have hurt to be in, running it was your best option especially since so wide open. Glad you are ok.
Trust your Colorado climometer and instincts!